A history and a primer. Iran’s nuclear deal with Russia and its opposition to the indefinite extension of the Treaty on the Nonproliferation of Nuclear Weapons make it clear that the Iranians are deadly serious about developing a nuclear weapons capacity, and that Russia is not likely to stop them. The nuclear deal, signed officially on January 7 in Tehran, was confirmed this week, against considerable American pressure. The deal is initially worth $800 million to Russia and involves the rebuilding of an abandoned power reactor that was initially constructed by a German company in the late 1970s. 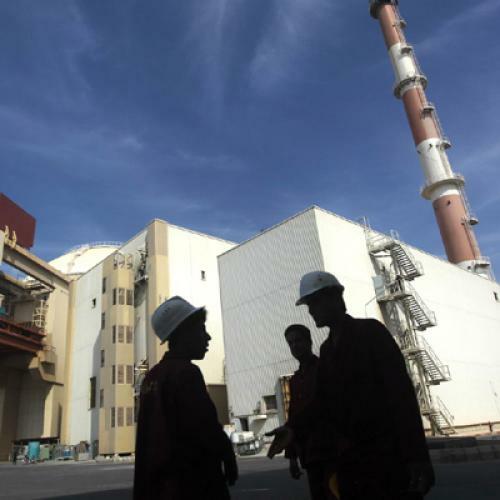 The deal could eventually net as much as $8 billion if Iran asks the Russians to construct an additional three power plants near the southwestern city of Bushehr, as well as a research reactor and other unidentified nuclear facilities. The military threat springs in part from the nature of the reactors. As Republican Senator John McCain of Arizona, a nonproliferation advocate, has pointed out, “The light water reactor going to Iran has the potential to produce enough plutonium to build thirty-five bombs per year.” To obtain the plutonium, Iran must be able to reprocess spent reactor fuel in some way that escapes the attention of the International Atomic Energy Agency in Vienna, which is supposed to monitor civilian nuclear exchanges. The United States is urging Russia to take the spent fuel back to Russia for reprocessing, without returning the plutonium obtained from it to Iran. So far, however, Russia has thumbed its nose at these requests. Russian-Iranian relations have been solidifying ever since Iranian President Ali Abkar Hashemi-Rafsanjani visited Russia in 1989 and signed the first of several multi-billion-dollar arms and technology transfer agreements with the Russian military. To cement these ties, Boris Yeltsin will visit Iran sometime this spring. If Iran were energy-poor and in desperate need of nuclear power, one might be able to understand Iran’s quest for nuclear power. But Iran is sitting on top of the third-largest oil and gas reserves in the world. (Saudi Arabia and Iraq are ahead of it.) If Iran really were short on energy, it could build gas-fired power plants at much lower cost, or make better use of its vast hydraulic resources. The truth is, it simply has no need for peaceful nuclear power. Besides, Tehran has become so cash-strapped it cannot afford such a massive investment. Despite its natural wealth, Iran has been unable to finance much-needed investments to maintain basic oil industry infrastructure, the primary source of hard currency. So what exactly are the mullahs up to? It helps to understand that Iran’s nuclear interests haven’t sprung up overnight. In fact, Iran’s history of nukes probably began a quarter-century ago. In the late 1960s or early 1970s, Shah Mohammed Riza Pahlavi was believed to have launched a clandestine program to explore the possibility of obtaining nuclear weapons. The shah purchased a research reactor from the United States and sent hundreds of young scientists to the United States and France for training in nuclear physics and engineering. In 1976 Iran’s Atomic Energy Agency signed a multi-billion-dollar deal with the nuclear power subsidiary of Siemens of Germany to build a power station at Bushehr—the one the Russians are now helping to rebuild. The shah also signed a similar deal with the French government to build two nuclear power plants in Ahwaz and purchased a 10 percent stake in the Eurodif reprocessing conglomerate that links France, Belgium, Spain and Italy. Lastly, he loaned $1 billion in cash to the French Atomic Energy Commission to build a uranium enrichment plant at Tricastin in the south of France. Under this 1974 agreement, Iran was to have “full access” to Eurodif enrichment technology and pledged to purchase a certain quota of the uranium produced at the Tricastin plant. All four of these deals were canceled almost immediately after the Islamic revolution in 1979, because Ayatollah Khomeini then opposed scientific and technical cooperation with the West. But the war with Iraq, which began in September 1980, and Israel’s bombing of Iraq’s French-built nuclear weapons plant in Osirak in 1981 prompted Iran’s leaders to reconsider their position. In 1986 Hashemi-Rafsanjani, then speaker of the Iranian parliament, launched a yearly nuclear power seminar aimed at luring exiled Iranian nuclear scientists back to the Islamic republic. That year Iran also began working closely with Pakistan. Dr. Abel Qader Khan, the father of Pakistan’s nuclear weapons program, visited Iran as a consultant, and the two countries signed a secret agreement under which Iranian nuclear physicists would be trained at Pakistani nuclear institutes. By 1992 suspicion that Iran was intending to build nuclear weapons had reached a fever pitch. Iran has denied in recent months that it has any intention to develop a nuclear weapons capability. But over the past ten years it has repeatedly tried to procure nuclear weapons material from Europe, China and the former Soviet states. In 1985 Iran purchased a “subcritical” experimental reactor from China, without declaring the purchase to the International Atomic Energy Agency. In July 1987 Iran purchased from China equipment that is used for enriching uranium. On January 21, 1990, Chinese and Iranian officials signed an agreement to build a twenty-seven-megawatt plutonium production reactor in Isfahan. U.S. satellite photographs taken in September 1991 documented major construction work at the site and the presence of large numbers of Chinese technicians. In 1991 Iran also attempted to purchase a research reactor from India and a nuclear fuel fabrication plant from Argentina, although both sales were blocked after high-level intervention from Washington with their respective governments. After this interference from the United States, Iran turned to the black market. Later in 1991, it reportedly purchased uranium-melting technology from Pakistan. It sent dozens of buying teams to nuclear facilities in Kazakhstan and elsewhere in the former Soviet Union, with orders to purchase nuclear material that was no longer controlled by Moscow. The prevalence of these Iranian buying teams and the lack of security surrounding the former Soviet nuclear production sites prompted the United States, in late 1994, to evacuate to the United States 600 kilograms of nuclear weapons material from a Kazakh civilian nuclear site—a site never previously thought to be associated with nuclear weapons production. Further, Iran has also purchased nuclear dual-use equipment from companies in Belgium, Germany and Italy, which could be used for a military uranium-enrichment program. These purchases have only heightened suspicions of Iran’s nuclear intentions. As a signatory of the nuclear nonproliferation treaty, Iran is subject to regular inspections by international officials of its declared nuclear facilities, to ensure that civilian nuclear technology is not diverted to weapons use. These inspections, however, are of dubious value. In 1992 the International Atomic Energy Agency sent a team of experts to Tehran to investigate rumors of clandestine facilities. According to the agency’s findings, one suspicious location they sought to visit—an alleged uranium-enrichment site in the mountains outside Qazvin—was found to be nothing more than a “recreation center” used by the Atomic Energy Organization. Other questionable sites were deemed equally innocuous. As team leader Jon Jennekins announced at a now-infamous press conference on February 12, 1992, in Tehran, the agency had concluded “there doesn’t seem to be a shred of evidence of any of these misleading misrepresentations.... Everything that we have seen is for the peaceful application of nuclear energy and ionizing radiation.” As it turns out, these findings may not have been accurate. According to both U.S. intelligence officials and some members of Jennekins’s own inspection team, two of the six sites the inspectors visited were in fact decoy sites, far from the nuclear centers of concern. Whatever the accuracy of that particular inspection, the agency’s experiences during inspections in Iraq and North Korea have reinforced the notion that the agency can only effectively investigate a clandestine nuclear weapons program if it receives the total support of the U.N. Security Council, including detailed intelligence from the permanent five members. Otherwise, it is at the mercy of its own member-states, which include countries such as Iraq, Libya, Syria and North Korea. While most intelligence analysts believe Iran’s nuclear weapons program is still in its early stages, they remain cautious when it comes to establishing how far Iran may be from the bomb. Help from Russia in any of at least three ways—technology transfer, stolen nuclear material, even disaffected Russian scientists hired by Tehran—could significantly accelerate the Iranian program. Iran appears to be making a concerted effort in all three directions. “Our real concern is aid that helps Iran to develop a nuclear infrastructure in the guise of a civilian program,” said one senior intelligence officer who tracks the Iranian program. This is precisely why the Russian nuclear deal with Tehran worries Washington. “The broader Iran’s nuclear technology base,” the official said, “the better chance the Iranians have of growing that key individual to a successful program: the nuclear weapons designer.” Iran is currently believed to have a cadre of some 2,000 nuclear experts, of whom only 220 are trained scientists. What’s a superpower to do? Given the acute difficulty of enforcing nonproliferation, one option is a total trade ban, as proposed by Republican Senator Alfonse D’Amato of New York. Though it’s a blunt weapon, it’s probably the best option now available short of war. Indeed, some in the administration are suggesting that the White House issue an executive order halting U.S. sales to Tehran in order to pre-empt legislation and retain the policy initiative. A trade ban would weaken the Iranian regime by eroding confidence in the ability of Tehran’s leaders to manage Iran’s ailing economy. It would increase the Clinton administration’s clout when urging U.S. allies to curtail sales to Iran. And if Iran is going to pay for Russian reactors (and other nuclear goodies), it will need to maintain or expand its oil sales. While not directly affecting Iran’s ability to sell its oil on the world market, the trade ban would accentuate Iran’s pariah status and deter companies and countries already hesitant over their dealings with Iran from expanding them. This is a risky strategy, however. Iran has threatened to use Washington’s efforts to block its nuclear ambitions as a pretext for sabotaging the nonproliferation treaty review conference this month. And it is attempting to cobble together a coalition of Third World nations disgruntled over Israel’s refusal to join the nonproliferation treaty and by what it calls the West’s “selective” use of nonproliferation. The U.S. ambassador to the conference, Thomas Graham of the Arms Control and Disarmament Agency, is making an all-out effort to foil the Iranian effort. Tehran is seriously worried by what it calls Washington’s use of “selective proliferation.” In Geneva last September, Iranian Foreign Minister Ali Akbar Velyati called the nonproliferation treaty an “outdated treaty.” Iran has apparently hinted to Russia that it might opt out of the treaty if the United States maintains its opposition to the Bushehr reactor deals, hoping to get the kind of trade and aid in exchange that the Clinton administration offered to North Korea. The coddling of Kim Il Sung and his successors may yet come back to haunt the United States. Kenneth R. Timmerman, a former staffer on the House Foreign Affairs Committee, is the publisher of The Iran Brief, a monthly newsletter on strategy, policy and trade. This article appeared in the April 24, 1995, issue of the magazine.